It was just a couple of days ago, when I wrote about the evolving Alien prequel, that I stated that I was not, as a rule, against prequels, sequels, reboots and remakes. Trust Hollywood, then, to put this assertion to the test with the news that following the departure of executive Jessica Goodman from Warner Bros, a whole batch of remakes in development hell have been re distributed to other WB execs. On first glance, I didn’t really have a problem with this. The news that proposed remakes that were going nowhere have been shared out amongst execs that may well not take them anywhere isn’t inherently newsworthy. However, when I read the titles that were being primed for reboots, I started to shudder. Lethal Weapon, Westworld and the like are considered classics by many. Thinking reasonably about it, though, and you can find justification. Westworld is based on a novel, written originally by Michael Crichton. any movie that is already an adaptation of someone elses source material is open, to my mind at least, to reworking. Adaptations of novels tend not to follow the exact path of the original story to the letter, and as such are open to many differing interpretations, and so can be brought to the big screen in different ways. The original movie is, in effect, a remake of the source story, so can not really get away with being proprietary about any potential reimaginings. As far as Lethal Weapon goes, the first film is an 80’s action movie classic, and one could argue has never been bettered in the buddy cop movie genre. The franchise has however been destroyed by just that, being turned into a franchise. With each subsequent sequel, the power of the first film has been diminished. The original story and its characters have already been destroyed, so the argument could be made that it is open to further destruction by way of a reboot. It is laughable, however. We have seen several buddy cop movies in the last year, with the likes of Cop Out etc…, so the only real reason for slapping the tag ‘Lethal Weapon’ on a new movie in the genre is purely for the financial cache that title carries. So, is anything sacred? On the face of it, no. If I can find justification for remakes of these movies, surely no movie should be beyond revisitation? I hadn’t fully explored this question before, but one title on the list forced me to do just that. 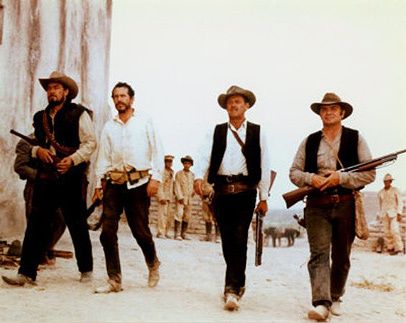 Warner Bros are considering a remake of the Sam Peckinpah western classic The Wild Bunch. For me, the greatest western ever made, and one of my top 25 movies of all time. This was the perfect situation to make me question my own feelings on the remake, and here follows my reasons why I don’t think The Wild Bunch should, or ever could, be remade. The Wild Bunch is a one-off. The product of a troubled yet ingenious filmmaker reaching his peak, Sam Peckinpah was the perfect man to film the story of the beginning of the end of the old west. Peckinpah was a hugely talented filmmaker who had lived amongst the last of the cowboys in his youth, listening to tales of the old west. He was also a drinker, misogynist and egotist. All his movies had greatness, but were coloured by the shaky work he did on his off days. Peckinpah drank on set, a lot, and whilst it may well have helped with his creativity it also took its toll on his psyche. The miracle of the Wild Bunch is that all the elements combined perfectly. Peckinpah’s love of the old west, the knowledge he gained from his youth growing up amongst cowboys. a fantastic cast, and the perfect plotline to show off his revolutionary filmmaking. The cinematography, the themes explored, and the superb cast are what made The Wild Bunch a stone cold classic. The story itself was nothing too original. A collection of aging gunfighters trying to pull off one last payday before civilisation and technology rendered them completely obsolete. A similar story can be found amongst many westerns, and on its own this would have made The Wild Bunch just another cowboy movie. It was the people, particularly Peckinpah and lead actor William Holden as Pike, almost Peckinpah’s own avatar in the movie, that gave the film authenticity and weight. Peckinpah’s cinematography and composition make every scene beautiful and ugly at the same time. His fantastic use of slow motion, a technique not popularised up until that point, made the action scenes in The Wild Bunch truly distinctive. These scenes had a massive influence on Hong Kong action movies, and John Woo in particular. To remake The Wild Bunch with the same story, but none of the filmmaking brilliance of its director is pointless. The movie did not make a lot of money, and compared to so many other westerns of its time is not actually that well-known amongst the mainstream audience. The title on its own will not give the remake any real financial boost, and no truly great direct will touch it. A mediocre western based on a story that is now almost cliché will most likely not succeed. The studio exec’s interest in the genre will almost certainly have been piqued by the success of True Grit, but it isn’t the popularity of the original version of that movie that has made the Coen brothers’ latest a financial success. It is the presence of two great filmmakers, a compelling cast, the Oscar buzz surrounding the film and the lack of any real competition at the box office. This is what gets me. If The Wild Bunch does get remade, it doesn’t affect me in the slightest. I don’t have to see it, and I can watch the original classic any time I choose. It is the fact that the studios don’t seem to understand how and why a film is successful that is almost frightening. Remakes are only worthwhile if they are based on a movie with a big fan base, or if they take a great story from a mediocre movie and fulfill its full potential. Rehashes of old movies with very little recognition amongst contemporary audiences, made to a far inferior standard to the original are not attractive to anyone. It seems I’m still not against remakes, even of films that I love. As long as great original movies are still being made, ensuring I still have a choice when I go to the cinema, I really don’t mind what films they choose to remake. I’m not one of those that believes that the modern audience should go back and revisit classic films from decades ago, rather than going to see the more contemporary looking remakes. I am sympathetic to younger movie-goers who find black and white or older looking movies a barrier to connecting with a story and characters. I do however think it is in producers’ best interests to use a little more common sense when they choose which properties to resurrect. If you make a new version of Citizen Kane, The Godfather, Star Wars or any other bona fide classic you are on to a loser. The update can only ever be inferior to the original on which it is based, and a large percentage of your potential audience is going to avoid it lest it leaves them feeling jaded about one of their all time favourite films. I appreciate that a remake of a bad movie that no-one remembers is a much harder sell, but it does leave far more scope for impressing an audience, and is far more conducive to creating a brand new, bankable franchise. This entry was posted in Articles, News and tagged box office, films, hollywood, lethal weapon, movies, remakes, sacred, sam peckinpah, success, the wild bunch, warner bros, wb, westworld. Bookmark the permalink.